Mediation has grown tremendously in the last three decades, yet only a small number of mediators have been able to benefit financially from its growth. The supply of willing mediators by far exceeds the demand for their services. Mediator trainee overoptimism and the lack of formal barriers to entry result in excess entry in the market for mediators. However, the lack of a formal barrier, but the existence of de facto barriers to entry, such as mediator selection practices and specialization, combined with excessive individual optimism, creates inefficiently high levels of entry. 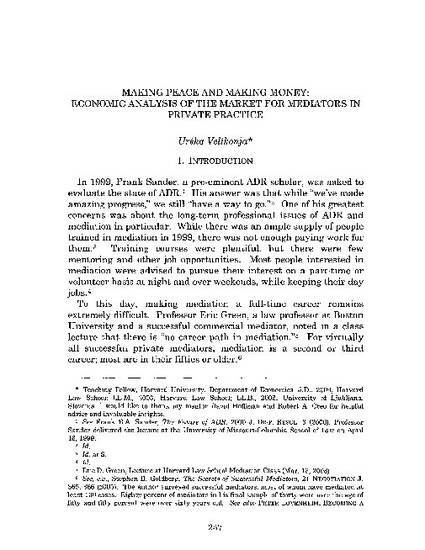 This is socially suboptimal: many aspirant mediators spend money pursuing what is likely an illusory career and forego other career options, even though they were never going to be able to make money as mediators.The article presents data that income distribution in the market for private mediation in uneven, and suggests that the market is a winner-take-all market, where a few mediators at the top of the pyramid are busy and well-paid, while the vast majority of aspiring mediators is constantly looking for work, yet makes little or no money. The article proposes economic reasons that contribute to this phenomenon: non-homogeneity of the product (i.e., mediation services), de facto barriers to entry, including mediator selection preferences and specialization, organizational structures, and inelastic demand for mediator services. Since mediation consumers often compare the cost of mediation to the cost of litigation instead of comparing costs of different mediators, new mediators are unable to compete for work on price. Information problems, in particular the lack of objective measures of mediator quality, other than settlement rates, and attorneys' control of access to clients, have made reputation the most important factor for mediator selection, making it difficult for new entrants to gain a foothold in the private mediation market. Small firm size further reduces the number of opportunities for new mediators to learn skills and acquire the necessary reputation to be able to practice on their own. Since experience and reputation are essential for success, only celebrity mediators, mediators with authority - such as former judges - and those with sufficient resources and stamina are able to survive in the market long enough to make a living as mediators. As a result, mediation is a second or third career for virtually all full-time mediators in private practice. This has important implications for aspirant mediators and for design of mediation training programs. Aspirant mediators would be well-advised to specialize in a particular field, such as environmental issues or construction, and gain a solid reputation among lawyers and/or business people in that field before starting a mediation career. In addition, mediation training programs ought to be redesigned to convey to aspirant mediators the realities of mediation practice. 72 Albany Law Review 257 (2009).